Alaskan Amber is from Alaskan Brewing of Juneau, Alaska. Alaskan Amber looks more pale in color in the bottle I had than the image on the right. However, even though I was expecting a Pale flavor, this is very much a classic Amber ale. It has enough malt and hops to bring forward a flavorful sip that is sure to satisfty. This ale is a perfect beer going into summer, as it has enough flavor to keep you satisfied, but not so much that you feel overwhelmed. I can easily see this beer going well with a salmon or other white meat on the grill. I have also had the Alaskan IPA which is a healthy, hoppy beer, so Alaskan is a beer that comes highly recommended. The guys and gals up in Juneau know what they are doing when it comes to the brewing! Nice job guys! For today’s brew from Seven Brides is Emily’s Ember. Upon pouring this beer, it’s apparent this amber ale is rich in color. I would almost call this beer a brown ale because of its deep color. 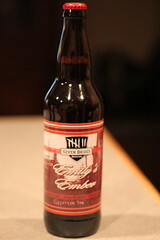 Through some serious malt action, Emily’s Ember has a very nutty taste that quickly exits your palette as the swig ends. The caramel comes and goes quickly and you are left with a slightly malty after-taste. I cannot compare the this amber ale to any other beer I’ve had. There’s a nut brown ale that is very similar to me that I think is from Newcastle. Honestly speaking, Emily’s Ember is a forgettable beer because is has no discernible qualities that make me remember it. It comes and goes without giving me any memorable facets to get me to talk about it to those who ask. If you’re into Newcastle, give Emily’s Ember a try. Otherwise, this is likely one to skip. Pub Too Noisey? Get a Bubble! According to the BBC, the next big thing sweeping across pubs and bars just might be giant plastic speech bubbles. 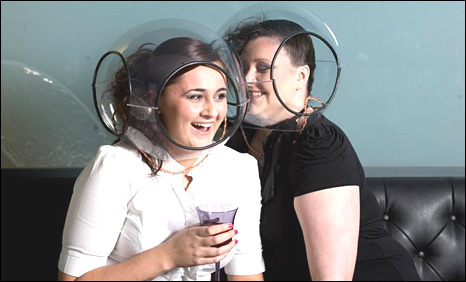 These awkward looking plastic spheres will allow you to hear the person right next to you, without being inundated with ambient noise from around the pub. Sure, the spheres look ridiculous but they might be useful. We all know it’s very hard to hear people in bars. What do you think? Would you wear one? Check out the full BBC article for more information. Happy pubbing! You are currently browsing the Pints And Steins weblog archives for May, 2010.